Shawn Patrick Ouellette/Portland Press HeraldVolunteers stack blocks of ice harvested from Thompson Pond. SOUTH BRISTOL, Maine - It's nearly time to harvest the ice. On the Sunday of Presidents' Day weekend, hundreds of volunteers will meet beside a frozen pond at the Thompson Ice House, now a small museum. For the better part of the day they will cut 300-pound blocks of ice from Thompson Pond using the same methods and many of the same tools five generations of the Thompson family relied on for about 160 years. The annual harvest has become a community tradition attracting locals and visitors, including families with young children. Everyone is welcome. During the 1800s, ice harvesting was one of the state's biggest industries, along with fishing, lumber, and granite. Throughout New England, businesses like Thompson's and others on the Kennebec River shipped ice as far as South America, India, and China until the advent of electricity made refrigeration possible, and the industry collapsed. Thompson was among those who switched to selling mainly crushed ice to lobstermen and fish packers. These days the museum honors that tradition every summer by selling small blocks of ice for a dollar apiece on the honor system to fishermen in the Boothbay region. And on the Sunday closest to July 4, it holds a big ice cream social. Hundreds of visitors come for cones and sundaes in hand-churned flavors made from Thompson Pond ice. In February, when the pond's ice field should be at least 12 inches thick, first-timers using hand saws cut and push blocks down a channel created by more experienced volunteers with a circular saw. In the channel, "rafts" of ice get pushed across the water to a wooden ramp where a pulley system hauls them up to the storage room. There specially trained young men take over the more dangerous task of maneuvering the heavy blocks with pole-mounted metal hooks and giant tongs. Many on the indoor crew are descendants of those who worked in the industry. 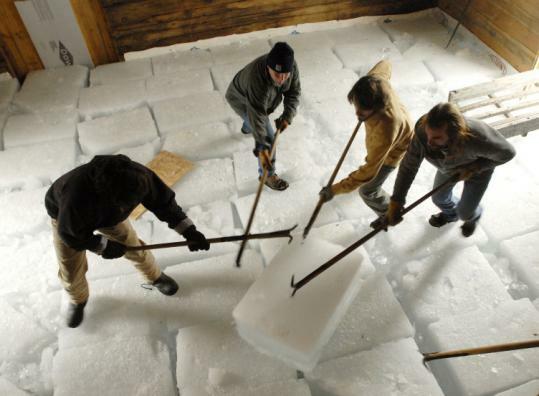 As the ice hurtles up the ramp and flies into the ice room, they stop each one and slide it into place, seven tiers high in the barnlike building. "Natural ice lasts longer than artificially manufactured ice because it is pure and contains less air," said Barbara Hamlin of Brunswick, whose late husband, Norman, was instrumental in establishing the museum. The double-walled storage room keeps the indoor temperature at a cool 40 degrees Fahrenheit even in summer, thanks to 10 inches of sawdust between the walls and salt marsh hay separating the tiers of ice. Despite some melting, the blocks stay solid until the last is sold around Labor Day. "From childhood, Norman remembered Mr. Thompson always delivering ice to his family's summer house down the road in Christmas Cove," said Hamlin. "In 1987, Herbert Thompson and his wife, Gwen, decided to retire from the business that was started by his great-grandfather in 1826. Rather than sell the land to a condo developer, they wanted to deed the ice house, property, pond, and its dam at no cost to a group that would operate as a museum to preserve traditional ice harvesting in Maine." Norman Hamlin, a retired naval engineer and professor, worked closely with Herbert Thompson to secure nonprofit status and establish the Thompson Ice House Preservation Corp., serving as its first president until he died in 2007. The current building is a smaller replica of the one that in 1974 was listed on the National Registry of Historic Places, making headlines because it was believed to be the only commercial ice house on the register that used traditional methods. Ice houses typically have a limited lifespan. During spring and summer, sun on the roof begins to melt the ice, which then shifts, causing the buildings to sag and lean. When Thompson deemed his ice house structurally unsafe, the corporation had the building dismantled and rebuilt using as much of the original wood as possible. It reopened in 1990 as a modest affair open to the public only in July and August, except for the harvest. Route 129, 12 miles east of Damariscotta. Look for sign on left. Open July and August on Wednesday, Friday, Saturday 1-4 p.m. Suggested contribution: adults $1, children 50 cents. Ice harvest takes place on Sunday, Feb. 15. There will be hot chocolate, coffee, hot dogs, and similar fare as a fund-raiser. Most volunteers arrive between 9 and 10. It's all over at about 2 p.m. Dress in layers.